Deluxe Canvas Shooting Coat, Creedmoor Shooting Coats: Creedmoor Sports Inc.
Shop all within Wilson Inc.
A soft, removable and washable terry cloth collar protects the shooter's neck and coat material. Express your pride in our great country. The flag will be sewn on to the left chest. Nylon mesh starts under the arms and goes down the two rear quarter panels on the back of the coat. You will not lose any support by choosing this option. This coat made of #10 Sta-soft cotton canvas duck has all of our cloth coat designes incorporated into one. It features a raglan sleeve design, pulse pad, and textured rubber backed by 1/4" felt padding. Front clsures are nylon quick-release buckles with adjusting straps. Two front pockets and a cargo pocket provide ample carrying space. 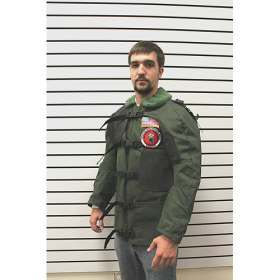 A large rubber body pad is provided for slip-resistant arm contact required when shooting from the standing position. This coat's design makes it ideal for NRA smallbore and high power right shooting. To determine size, use the diameter of your chest. If abdomen diameter is larger, use the abdomen measurement instead. Sizes: 30-58, right or left handed. Made to Order. May take 2-4 weeks to ship. Great quality and true to size. Just enough room for a good though sweater underneath. Only complaint would possibly be the sleeves being a little long. But otherwise fantastic! Great coat for the money. Fits good and has plenty of adjustments so you can wear a sweater underneath. The jacket fit exactly right. I measured as you suggested and my worry was that he is a lifter and large on top but with a small waist. He cinches it with the straps and it fits nicely. It is very stiff when you first receive it but it just takes use to soften it. He is very very pleased with this jacket. I love this jacket and it's just what i was looking for to help prepare myself for camp perry. Wish it was a tad tighter so keep this in mind when sizing yourself. Go one or two sizes down. Either way very pleased. The shooting coat I was using was one I bought 30 years ago. 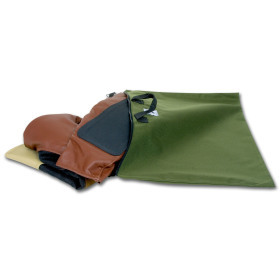 This Creedmoor coat is made of heavier duty canvas and fits perfectly. I like it much better than the old one. The jacket fits me perfectly and makes my shooting easier. I struggled getting a solid prone, but with this jacket it is a new ball game. After reading through the reviews on the Canvas Coat, I decided to purchase it since I have heard nothing but good things about products from Creedmore. I was highly surprised when I received the product so quickly and after following the suggested sizing listed in the question and answer section, the coat fits perfectly with a sweatshirt on. (there is room for two if needed) Unless I start shooting with a heavier rifle for the matches, this coat is all I need in order to enjoy competing in the high power competitions. I want to thank Creedmore for the awesome quality that they put into the jacket and will be ordering the rest of my gear from them as needed. When sizing it is important that you follow the guidelines in order to get the best fit. This product greatly exceeded my initial expectations. I just received my shooting coat and shooting sweater today. This is my first shooting coat. It's all it's advertised to be. It does cause you to sweat! I'm in Rochester, NY and it's 63 degrees right now. My basement is cool. Within minutes of putting the sweater and coat on I was sweating! You WILL drinks LOT'S of water with this thing on. That said, the craftsmanship is impeccable! Made in America. I'm not disappointed and do highly recommend this jacket. Great job Creedmoor. ALL perfect !!!!!! !, thanks for everythig. thanks. I bought this coat about 10 years ago, turned out to be one of my best investments to improve my shooting. I have been a High Power shooter for about 20 years. Due to spinal injuries I can no longer shoot across the course but I CAN shoot prone. I have had two Hardback coats and still have a Monard Prone jacket. The Monard is very comfortable but pricey and is not holding up very well. I decided to try the Deluxe Canvas coat as a prone jacket. I asked Gina to leave the body pad, front pocket and cargo pocket off and sew on shoulder straps. In the end the coat is very comfortable in position and the Creedmoor elbow, pulse and shoulder pads do everything I need in a prone jacket for a fraction of the price of a specialized jacket. In short, it is an excellent value that works well. This is my first shooting coat. I don't have much experience with coats, but I am quite pleased with this one. 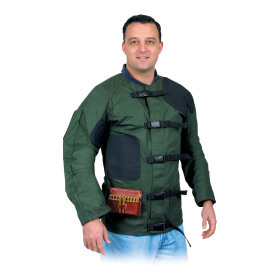 It fits very well, is very well made and does what shooting coats are supposed to do. It takes a lot of the discomfort out of using a sling and I don't seem to have any problem from my pulse. It's hot, of course, especially with a sweatshirt underneath. I prefer to wear just a light, long sleeve jersey for sitting and prone, and then add a sleeveless fleece vest for standing position. 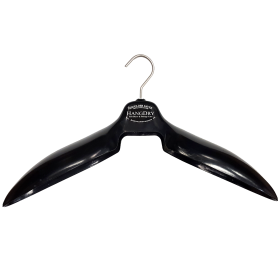 This reduces any chafing from the stiff canvas and gives more flexibility in the arms. The coat is quite stiff. I haven't used it a great deal, but it has loosened up a bit with use. I do wish there was a choice in colors. Dark green and black certainly do absorb heat from the sun, especially here in the desert. But, I'll probably be glad of a dark color in Fall and Winter. Have been using Creedmoor shooting jackets for over 30 years -- Excellent quality and service keeps me coming back. This is an amazing coat for the price, well constructed and heavy duty. The customer service was top notch. I'm a happy camper! Thank you all at Creedmoor. Great Coat, Great Service, At first I questioned the placement of the Flag, Then I realized it was over my Heart, silly me! Thanks Again, I'll be back. I have received the canvas shooting jacket and jersey along with the embroidered crests, they are all of top excellent quality materials, with a perfect fit. I am very proud to wear such quality shooting equipment at the range where they arise a lot of interest from fellow shooters as well. Thank you for the quality of fabrication and materials used in this shooting jacket and jersey, the crests are very attractive and add an additional ''look'' which attracts the eye. You will not regret buying this coat. If you usually wear a sweatshirt under your coat, keep that in mind when taking measurements. Ordered it in left hand and couldn't be more pleased . Great coat and made in America. See ya on the range ! From the online catalog, I was not certain of what I would get. Particularly regarding size. Having watched the video on measurements, I knew what they said and I followed the instructions. The fit was perfect. This is a very well made shooting jacket. Very tight in the torso but with very good movement in the arm area. I have wide shoulder and thick arms. Again, I really like the coat and heartily recommend Creedmoor Sports. Well made plan to use it hi power matches in the hot humid NJ temps. Size was correct and sleeve length was right on. Can't beat the price. Plan on using this coat along with my Hardback. It's been nasty weather, so I haven't shot with the coat yet, but it sure looks and feels like a custom item. I measured myself with a common carpenters retracting tape across my chest under my armpits, and this coat fit nice and snug with the T-shirt I tried it on with. Adding in a sweatshirt, as everyone online says to do, will snug it up better yet. My initial opinion is it's a very quality item for the cost. Great shooting coat! Better than the one we had at Parris Island in boot camp in 1969. Best customer service I've ever seen. Thanks to Michelle & Jose and the gang (sorry I can't remember everyone's name) at Anniston, Alabama's Creedmoor. Lol Thanks again to Michelle for standing outside in the cold waving her arms to get my attention to find the place! First time buyer. 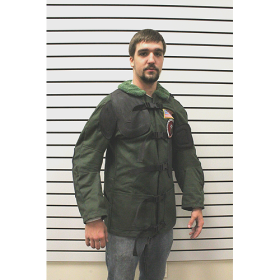 Ordered deluxe canvas Shooting coat , it didn't quite fit my middle section well .Gained too many pounds since 1969 when I was in the Marine Corp. Semper Fi . Took the coat to Creedmoor Sports in Anniston, AL, they made some adjustments, fits like a glove. Great service from all at Creedmoor , thanks to everyone, Michelle keep waving your arms to get me there . i ordered this coat in left hand, one size smaller than my suit jacket. an inspection of the stitching and fabric reveals it to be very well made. the canvas is stiff, and the padding under the generously sized rubber patches further stiffens it. it's not heavy, but buckled up it is nice and tight across my shoulders and my elbow has good grip on the front pad. the pulse pad is noticably thick and well designed, and will allow me to cinch my sling slightly lower on my arm. with a heavy sweater underneath my coat it functions even better. i couldn't be happier with it, and as been pointed out, it is made to order in the usa. if you've been considering one, this is the most coat per dollar you will find. Want to shoot better ? Buy a coat , buy a glove and practice PROPERLY you will improve. Great quality great service Made in USA. This shooting coat for High Power Rifle Competition is well made and comfortable. I have a previous shooting coat made of canvas and it has lasted me many years and is still not worn out. My right eye is weaker now so I went to shooting left handed. So this is why I got this new shooting coat and expect to be using it for many years to come. Just moved up to the Deluxe Coat after about 6 years with the Basic Coat. Shot my best yet Vintage Military Rifle Match score this morning wearing the Deluxe Coat. As always, the best quality. Thanks for making it in America. Ordering Information and Quality of Product. When ordering one of Creedmore's hunting jackets the information provided can be somewhat misleading. The information given on the website indicates a handmade product that can take 10-20 days to arrive, then, when you place an order it indicates "IN STOCK." In stock does not mean it is ready to ship. A more appropriate note would be, "made to order." The coat I ordered, when it arrived, was perfect. I could not have been more satisfied with the product. A quality item that I am sure will wear and preform perfectly. © Copyright 2019 Creedmoor Sports Inc.. All Rights Reserved. FREE GROUND SHIPPING: This is a limited time offer. 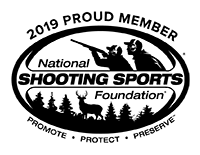 Some exclusions apply (HAGAR brass, tumbler media, Sierra bullets, portable air gun ranges, targets, primers, cleaning rods, Turbo accessories, and posters). Drop shipped items (all Giraud and Gracey products, bullseye cameras, CTK products) exempt. Creedmoor Sports Inc. reserves the right to modify or cancel the offer at any time. Coupon cannot be combined with other coupon codes. Free Shipping valid for 48 contiguous states only. Not valid on previous purchases. Must use coupon code at checkout.